The palette OCEAN comprises flattering shades of Sand, Shell, Seaweed and Lagoon. Sand can be used as a highlighter or to lighten the darker shades. 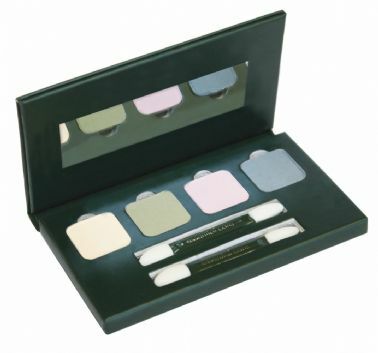 Essential Care eye shadows are easy to use and are the ultimate in care of the delicate eye area. They are formulated entirely from pure mineral colours, skin-caring organic plant oils and antioxidant extracts including calendula, chamomile and sea buckthorn, which are ideal for sensitive or mature skin. The shades are refillable and the gorgeous palette, made from FSC-certified card, comes complete with 2 dual-end vegetable-origin applicators and a mirror for ease of application. The palette is entirely recyclable.